In 1959, the Royal 500 went through another style change. The Model E featured a bright gold-plated faceplate and the familiar two knob “Owl” look. Zenith mass produced these sets in maroon, white, black, and some in white fronts with brick red backs. They can be found with one of two grills: a cone shaped brass plated grill or a bright gold rounded mesh deluxe grill. Model E’s are commonly found today, but most all of them have suffered either scratching or pitting to their gold face. Finding one in nice condition can be a real challenge. 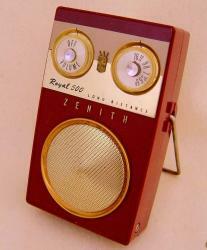 Originally introduced at $75.00, Zenith soon reduced the price to $59.95. I have been looking for a nice-condition 500E two-tone red and white for some time. Do you have one available? No other accessoreis needed.